A version of this story originally appeared in the Feb. 8, 2016, issue of Sports Illustrated. Subscribe to the magazine here. Jarrod Uthoff is many things—rebounder, three-point marksman, shot swatter, cord-cutter, devoted angler—but hopeless romantic is not one of them. Consider this account of how he asked his girlfriend of four years, Jessie Jordan, to marry him last August. "Took a walk down by the river," Uthoff says, "and I proposed to her." The success of the Hawkeyes—who have surged to No. 5 after being unranked in the preseason—may come as a surprise. The ascetic nature of their national player of the year candidate should not. Uthoff, the 6'9" fifth-year senior forward who is averaging 18.6 points, 6.3 rebounds and 2.9 blocks for a 17­­–4 team off to its best start in 15 seasons, has neither cable television nor Internet at his apartment, yet is an Academic All–Big Ten selection who graduated with a B.A. in economics and is pursuing a graduate degree in sports management. Most of his memorable tales from the outdoors involve hooking fish, not fiancées. Whether he's missed or made five shots in a row, his demeanor is so stoic that his older brother has suggested that Jarrod should at least attempt to look like he's having fun. But while Uthoff (YOU-toff) prefers to play it cool, that hardly means he doesn't care. He has an interest in politics and attended a recent Carly Fiorina event in Iowa City. He is also a stickler for grammar, wincing at poorly phrased text messages. And his proposal, if simple, was more romantic than he made it sound: After Uthoff and Jordan dined at 30hop—one of Iowa City's trendier spots—he said he wanted to take a walk, so the two parked down the road near the Iowa River Power Restaurant and strolled across the wood-planked bridge behind it. Once they reached the water's edge on the other side, Uthoff asked Jordan to turn around. He had to ask twice because she suspected he just wanted to steal her view. Then Uthoff presented the ring from bended knee. "That's as extravagant as it gets," Jordan says. "To be honest, I would have hated anything else. We never try to make things a spectacle." Their wedding is July 30 in Urbana, Ohio. Until then Uthoff has another date in mind that he hopes ends happily ever after: April 4, in Houston. Like many other title contenders—Oklahoma, North Carolina, Villanova, Michigan State and rival Iowa State—the Hawkeyes thrive because they're led by veterans. With a starting lineup of four seniors and a junior, they are the only team ranked in the top 20 nationally in both adjusted offensive efficiency (seventh) and adjusted defensive efficiency (16th), according to kenpom.com. 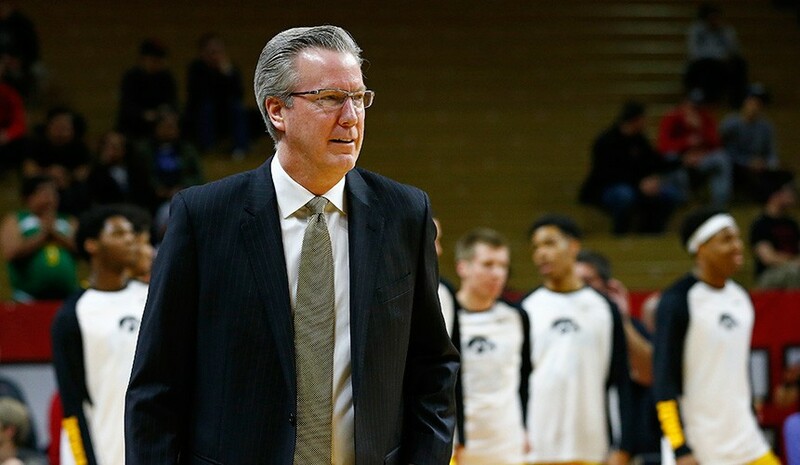 "[Upperclassmen] tend to not turn it over as much," sixth-year coach Fran McCaffery says. "They understand the importance of rebounding and ball movement." McCaffery's teams play free and fast offensively; this is the second time in three seasons that Iowa has one of the country's 10 most efficient attacks. But two years ago the Hawkeyes' No. 5 offense was offset, to put it mildly, by a defense ranked 120th. Iowa won 20 games in 2013–14; the Hawkeyes also lost seven of their last eight, six of them by seven points or fewer. "The message was clear," McCaffery says. "If we want to be better, we have to play better defense." Iowa's coaches preached squaring up on ballhandlers instead of forcing them baseline, to limit the angles from which an offensive player could attack. But that was a technical tweak. The Hawkeyes still play traditional man-to-man, with an occasional zone press thrown in. The difference has been the competence of the defenders. Five players from that 2013–14 squad represent the current team's core: Uthoff, 7'1" center Adam Woodbury and guards Mike Gesell, Anthony Clemmons and Peter Jok (the team's only other double-digit scorer, with 15.3 points per game). They've improved each season, rising to 34th nationally in defensive efficiency last year before this season's breakthrough. "You know when somebody is going to go for a steal," Uthoff says. "You have a good idea of who you're playing with and help-side rotations. Defense is a lot of playing as one unit." It doesn't hurt, though, to have a singular weapon. Uthoff's athleticism and Mr. Fantastic limbs make him a natural shot blocker; Gesell remembers pulling up for a jump shot beyond the free throw line during one of his first Iowa practices and seeing Uthoff in the paint. "I thought there was zero chance of him making it to me," Gesell says. Uthoff covered the ground and got a hand on the ball. "I thought every college player was going to be like that," Gesell says. "I quickly realized Jarrod is just very good at closing out." Yet Uthoff only blocked 91 shots in his first 67 games for Iowa. He had 60 in his first 21 games this season, the seventh-best total in the country. Uthoff has been capable of high-volume swatting; now he has mastered the mechanics of doing it, and that has made him more confident and aggressive. He could become the first player since 1994–95 (the first season such data was available) to average three blocks and two made threes per game. "He's doing a much better job off the ball," Gesell says. "When someone is driving on me, I just try to tall up because I know [Uthoff] is coming weakside to block it. Or someone like [Woodbury] just talls up on his guy, and Jarrod comes over and tees off on it." All this means that the Hawkeyes can play solid position defense and gamble less. The veteran players appreciate the ancillary benefits. "Our defense leads to our offense," Woodbury says, "and everybody loves playing offense." The Iowa media guide lists Cedar Rapids as Uthoff's hometown, but he grew up about 30 miles southwest, in Marengo (pop. 2,513). Uthoff did go to Jefferson High in Cedar Rapids and regularly stayed with his older sister, Erika, who lived there, to minimize the commute. His father, Dale Sr., worked as an electrician at a refrigeration plant in Amana. His mother, Diane, managed a Casey's General Store in Marengo. They woke around 5 a.m. every day, and if Diane didn't have someone to cover the evening shift, she or Dale Sr. would take it on and return home after 11 p.m.
Jarrod, the youngest of five children, concedes he was a bit spoiled, or at least drowned in attention. But he was not oblivious. "They worked themselves to the bone," he says of his parents. "You look at that two ways: You can say, Well, they've given me everything—why should I have to work for anything? Or you can take the approach that they worked 15 hours a day, or sometimes even more than that, and they've given me everything. I want to take that mind-set." Uthoff's hoops career has been a family affair. In 2002 his brother, Dale Jr., graduated from Drake and deferred a job opportunity in order to hang out with Jarrod. They spent the summer visiting fishing holes and hoops camps around the state. Along the way Dale Jr. talked to parents about AAU programs Jarrod might join. Jarrod, who had shown talent from an early age, subsequently earned a spot in a Cedar Rapids–based AAU team, and Diane or one of Jarrod's sisters videotaped his games to be celebrated or nitpicked by the whole family over pizza. While Jarrod was developing the skills that made him Iowa's Mr. Basketball as a senior—he averaged 26.2 points, 11.2 rebounds and 3.2 blocks—it was clear that he was wired differently from most top athletes. "He looks almost nonchalant at times," Dale Jr. says. "Rather than running around and hollering and high-fiving people, he's purely channeled [that energy] into focus." Uthoff signed to play at Wisconsin but left after a redshirt season in 2011–12 because he didn't feel the Badgers' methodical style of play was a good fit for his skills. He chose to come home to Iowa, even though he had to pay his own way for a season and sacrifice a year of eligibility because he transferred within the Big Ten. That season in Madison was far from wasted, though, as Uthoff met Jordan—who played golf for the Badgers before transferring to Iowa a year after Uthoff. 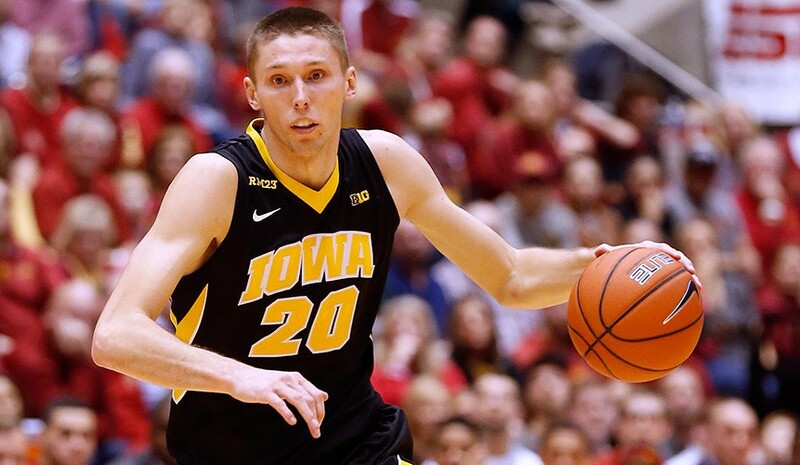 After arriving in Iowa City, Uthoff felt comfortable immediately in McCaffery's up-tempo system, playing in all 33 games and ranking second on the team in blocks (35) and fourth in scoring (7.9) in 2013–14. At power forward Uthoff shoots 46.4% from three-point range, and his 92 attempts from long distance rank second on the team. "Him at the four spot is a b---- of a matchup," says Notre Dame assistant Martin Ingelsby, whose team weathered 20 points from Uthoff in a 68–62 Irish win on Nov. 27. "It's such an asset. When you have a four man that stretches the defense, that opens everything up for the rest of the guys." Uthoff's consistency, partly a function of having beefed up from 210 to 221 pounds and partly due to his metronomic personality, has become his hallmark. He has failed to reach double figures only once, a nine-point effort in a 74–68 loss at No. 8 Maryland on Jan. 28. He takes and makes big shots even though every team schemes to prevent him from getting the ball in critical situations. "The guys that are out there with him, when it gets a little sticky, they know where to go," McCaffery says. "That's a comforting feeling." Back in the summer of 2002, Jarrod and his brother were on the Iowa River, fishing for catfish after dark, when Dale Jr. felt a strong tug. As usual, he handed the reel to Jarrod to finish the job. This plan was swiftly abandoned when it appeared little brother was about to be pulled into the water. Once the fish neared shore, Dale Jr. shined a flashlight on the surface. The first thing he saw was the tail. It was three feet behind the fishing line. "We were like, 'Ho-lee buckets, this must be a dream,'" Jarrod says. It was, in fact, a 50-pound flathead. The brothers brought the monster back to the house, Dale Jr. lugging it on his shoulder as Jarrod roused his parents. "You can't forget a moment like that," Jarrod says. Now he's in line for an even bigger haul, with player of the year chatter circulating around Iowa's push for its first Final Four berth since 1980, which may require him to become more comfortable in the limelight. It was easy for Uthoff to avoid attention when he dispensed a ring; he's bound to attract it as he chases one.